Warning – Trespassers Will Be Horribly Mutilated – Look behind you, a Three-Headed Monkey! I recently decided to replay the LucasArts adventure game that started it all: Maniac Mansion. Inspired by cheesy horror and sci-fi b-movies, the game invented many of the conventions that would define the genre for the next decade. I had previously played the (heavily censored) NES version, but used the ’89 PC remake for this review. The game follows the protagonist Dave, on his quest to free his girlfriend from the hands of crazy scientist Dr. Fred, who under the influence of an evil meteoroid from outer space is performing experiments on her in the basement lab of his mansion. Aside from Dave, you get to pick two other kids between which you can switch freely during the game. Each of them has a different skill, allowing you to win the game in a different way: for example, there is Bernard, the nerd who can fix electronic devices, and Punk Rocker Razor who can play the piano and record her song to get a record contract in the course of the game. 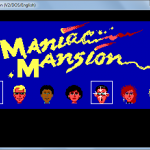 Maniac Mansion was the first game to use the Scumm (Scripting Utility for Maniac Mansion) system which represented a significant change from earlier adventure games. Instead of using a text parser, the game lets the user select actions from a list on screen. The player interacts with the world by combining these verbs with items in the character’s inventory as well objects on screen. The mansion itself consists of a series or unique rooms. Each of them containing some items to collect, objects to use such as record player, and most importantly lots of flavor text descriptions of the game world. Compared to modern games, the graphics are fairly sparse and unchanging, even in the ’89 remake which improved the graphics of the C64 original. The sound effects are rudimentary, but the music score is quite memorable since it features unique themes for each character. As you explore the mansion you need to keep an eye out for its inhabitants: while some of them can be befriended, others like Fred’s wife, creepy Nurse Edna, will lock you up in the basement dungeon whenever you encounter them. The plot is developed further by cut scenes showing what is going on in other parts of the house, as well as random events such as a package being delivered that you need to intercept before it reaches its actual recipient. The game mechanics rely on the need to switch and trade items between your characters, although much less so than in the game’s successor “Day of the Tentacle”. This is most visible in the aforementioned dungeon, from which you can initially only escape by a combined effort of two kids. In retrospect, it is interesting to see how puzzle mechanics would improve over time in the adventure genre. For example, there are numerous rooms which upon first visiting have their lights turned off, forcing the player to go on a annoying hunt for the pixels that represent the light switch before proceeding. There is even a point in the game when the power to the house gets turned off for five minutes, during which you are just running around on an almost black screen. 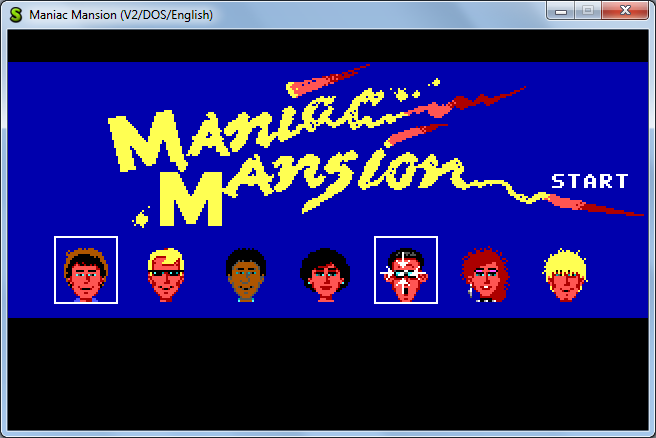 Compared to later LucasArts adventures, Maniac Mansion is not a very forgiving game. There are numerous ways to permanently kill characters ranging from drowning in the pool to being killed by Ed Edison after microwaving his pet hamster. Additionally, there are ways to end the game for good, for example by blowing up the nuclear reactor which powers the mansion. As if that wasn’t enough, there are also ways to unintentionally put the game into an unwinnable state given the particular combination of characters you chose. Nonetheless, I’d certainly recommend the game for any fans of the adventure gaming genre, specifically because the great atmosphere and weird humor that would become a signature of LucasArts adventures make this game a memorable experience.